We first introduced you to Nashville's The Gentle Barn when it was just a piece of property and an idea. Now, animals are being rehabilitated and people are finding ways to heal. NASHVILLE, Tenn. — We first introduced you to Nashville's The Gentle Barn when it was just a piece of property and an idea. Now, animals are being rehabilitated and people are finding ways to heal. 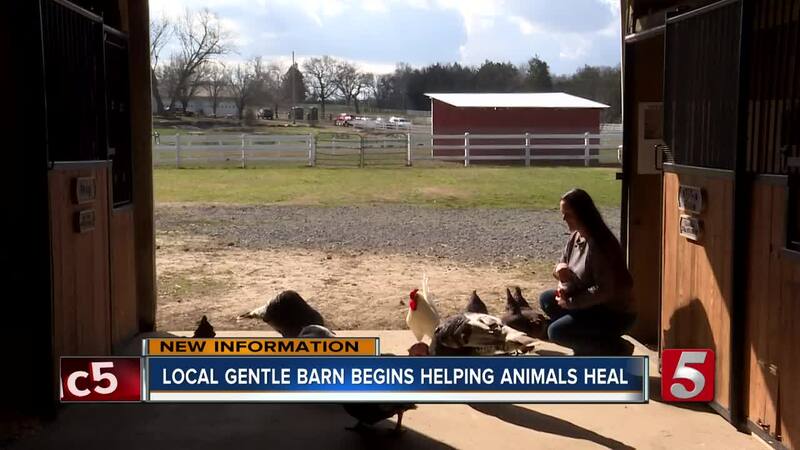 "It really is a dream come true," said Ellie Laks, founder of The Gentle Barn. Laks may be the founder, but it's her animals like Lolli the baby goat, who usually steal the show. "Lolli really is the perfect example of what The Gentle Barn does," she said, "We bring them in and we heal them physically and emotionally. We set them up for a great life." Walking around the lawn you almost don't notice them, but Lolli is fitted with two prosthetic legs after losing her real ones to frostbite. "She hobbled around as best she could for eight months in terrible pain. Not been able to get around much at all," Laks said. Laks takes in animals like Lolli, who are abused or neglected - that no one else wants or can take care of. She believes animals can help people, struggling with just about anything. So now with her 40-acres outside of Nashville, she hopes to help more animals and more people find their footing. "Fills our heart with joy," she said. The Gentle Barn has two other locations in Los Angeles and St. Louis. They're open every Sunday from 11:00a.m. to 1:00p.m. During the week they host school field trips and groups of at-risk and inner city children.